Sign up with either the bronze, silver or gold packages in December 2013 you will get 2 syndicates for the price of 1. So you will get an identical syndicate with different numbers to play with for 30 days giving you up to an extra 1274 chances to win for free! Love My Lotto is the World’s leading multi lottery syndicate company. The site was established back in 2009 and is based in the UK. 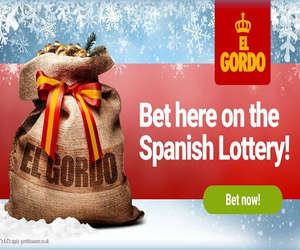 Their main aim is to run online lottery syndicates that significantly increase your chances of winning a cash prize or even the jackpot in major National and International lottery draws. By playing at Love My Lotto you can choose to be in their bronze, silver or gold syndicates which cost from as little as £3 per week but give you as much as 4338 chances of winning a prize. Opening / Special Offer: If you sign up with either the bronze, silver or gold packages in December 2013 you will get 2 syndicates for the price of 1. So you will get an identical syndicate with different numbers to play with for 30 days giving you up to an extra 1274 chances to win for free! Bronze – Gives you 2 Euro Millions entries per week on Tuesday and Friday plus 4 entries into the Millionaires Raffle. 2 entries on Wednesday and Saturday into the Lotto draw plus 4 entries into the Lotto Raffle. 2 entries per week into the £1 million daily draw. Thats 1239 chances to win a prize for just £12 per month. Silver – Gives you 4 Euro Millions entries per week on Tuesday and Friday plus 8 entries into the Millionaires Raffle. 4 entries on Wednesday and Saturday into the Lotto draw plus 8 entries into the Lotto Raffle. 4 entries per week into the £1 million daily draw. Thats 2479 chances to win a prize for just £24 per month. Gold – Gives you 7 Euro Millions entries per week on Tuesday and Friday plus 14 entries into the Millionaires Raffle. 7 entries on Wednesday and Saturday into the Lotto draw plus 14 entries into the Lotto Raffle. 7 entries per week into the £1 million daily draw. Thats 4338 chances to win a prize for just £36 per month. The winnings are split between the 37 people in each syndicate. Winnings: If the syndicate you are in wins a prize then you will be notified via email and any money will be added to your online wallet. If your prize is less than £500 then you can use it to pay future games or you can withdraw it to your debit card that you used to sign up with. If you win an amount between £501 to £5000 then this will be sent directly to your bank. For any prizes above £5001 then you will be contacted so you can be paid in person. Payment Info: You can sign up for each subscription using any major debit or credit card. Have been an affiliate with LoveMyLotto since they launched in 2010 and have always enjoyed promoting their well thought out syndicate options. I have not been able to get my winnings. I have seen the sums that I won. But can’t find them again. Help please. My mobile number was 07549354456, at the time of association with lotto.